Machine Learning is the best way to make progress towards human-level AI. Master the valuable machine learning skills that are in demand across countless industries. Grab it for a Deal Price of $8999 $24 only! A Look At One Of The Videos Included In This Bundle! This Machine learning course introduces about business intelligence (BI) and then slowly goes towards report generation, report overview, Seibel objects in BIP and so on. It is about 2 hours long. Although not directly related to Machine learning (ML), but it bridges the gap between BI and ML. This is the fundamental module which comes in more than 12hour long format. It introduces basic concepts of ML and AI. It talks about things such as representation, state space search, Heuristic search, logic and reasoning, rule-based programming, decision making etc. This one is also a long module with 14 hours of content. It teaches about fundaments of BI such as Extract, transforms, load, frameworks for BI, metadata, project planning etc. This Machine learning course is probably the most important module so far. It introduces R which is the most preferred language for ML. Although it is more than 20 hours long it covers everything in detail such as data manipulation, linear regression, KNN, Decision Tree, SVM, Feature extraction etc. This module covers concepts such as class imbalance and grid search, Adaboost regressor, affinity propagation model, Gaussian mixture model etc. It is 6 hours long. This 8 hours long machine learning certification course talks about sampling, probability, statistical distribution, matrix algebra, hypothesis testing etc. This machine learning training is relatively short. It covers Bayesian model and explains AB testing concepts along with the code. It is only an hour long. Only 18 minutes long, it talks about face detection on a very high level and most of the detailed concept is covered as a separate course for advanced users. This 2 hours long video talks about AWS data sources, value, and Hands-on ML model development. This machine learning course is 3 hours long. It teaches concepts such as python basics, python packages, Python regression and classification in python, Evaluation matrix etc. This 2-hours long training video covers the basics of NLP such as text preprocessing and feature extraction etc. This one is projecting that students need to complete. Dataset is given, and the problem is explained to them. They can use any language of their choice to solve it. Supply chain project is explained in this module and students are given heads up on how they can approach the problem. Hints and solution are provided in the end. This project teaches about applying a regression model to solve the price prediction problem. These projects ensure students do hands-on exercises along with theory sessions. This project teaches the concept of classification on a real dataset. Faculties ensure that the students have learned the key skill by actually solving a problem. This module is again a project for fraud detection which students need to complete. This short module introduces the basic concepts of deep learning and neural network with implementation. This 5-hour long video covers topic such as data visualization in general and then how it can be done in R.
This is quite long, 13 hours. It comprehensively covers TensorFlow and its applications. 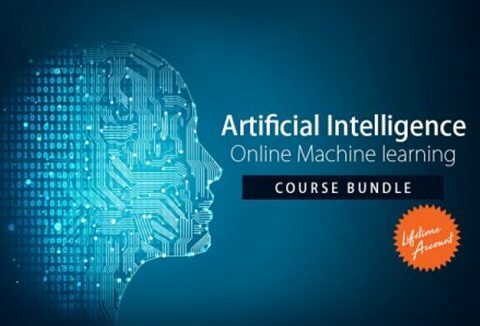 What Will You Get With This Bundle Of Online Machine Learning? This Bundle of Online Machine Learning Courses includes 19 comprehensive machine learning courses with 90+ hours of video tutorials and Lifetime Access. Each of these courses thoroughly covers one or other fundamental concepts of machine learning. Also, provide enough examples and hands-on practice materials that even the beginners in machine learning can understand quite well. What are the requirements / pre-requisites to this Course on Machine Learning? It is an amazing collection of practical and hands-on learning of the most updated training programs and projects in the area of Machine learning. and much more right from the basics to advanced concepts. You will receive a 100% off discount code to redeem on Educba website to get access to the course. This deal includes lifetime access to the course. You get verifiable certificates for each course included in the bundle with a unique link. Start your journey to #jobs of tomorrow with online machine learning certification. For A Lifetime At A Deal Price Of $24 Only!